Thank you for such a memorable and unique day in Tuscany! We all had such a great time (although next time we need to train for your 'easy' ride ;-) ) and appreciate the trouble you went through to arrange such a delizioso lunch at a wonderful location. It is a day none of us will ever forget. It was so nice to meet you all. Thank you again. Then go down to the right side of home page and select GO TO FORUMS NOW. 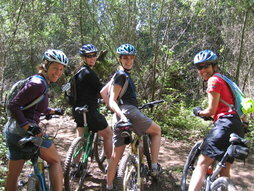 In forums, type these words in the Search box: Bike ride Tuscany. You should see a message from JustDucky9 about a Fantastic Bike Ride... Hope you like it - all true! Thanks again for a terrific time. You're the best! Charles and Antonina Bari, New York, U.S.A. I can’t believe 1 week ago I was riding a bike through the beautiful hills of Tuscany & drinking Chianti and now I’m back in New York! This is terrible!!! Antonina – my wife - and I both had a great time last Saturday. 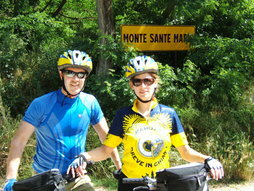 I’m glad I rode with you that day because seeing the Chianti region was as nice as I was hoping it would be. I equally enjoyed both riding through the little villages and through the countryside. It was all very nice. I wish I could come back out for another ride tomorrow. I’ll certainly recommend you should I hear of anyone else I know visiting the Florence/Tuscany/Chianti region. Also, if you see Sean (I think that’s how you spell his name) again, could you thank him for the terrific tour he gave us? He was the guy at the second winery that we stopped at. I think it was Casa Sola? Or something like that? I can’t remember at the moment. I really enjoyed his hospitality throughout his tour and I was very happy with the wine-tasting presentation along with the snacks. He was very nice and made it an enjoyable experience for us. To stand right next to the grapes in the vineyard field and see the farms along the rolling hills made it all worth it. Thanks again. Grazie molto and buon giorno a te. Io spero quando ritorno a Italia il mio italiano è meglio! 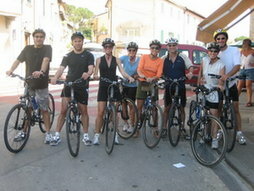 Thanks so much for a wonderful day biking in Tuscany. You are an outstanding guide. The riding was fun, the scenery marvelous and the wine excellent. We look very much forward to returning to Italy and joining you for a longer ride next time.